Not your average poached pear – well, average in that everyone does them, but not so average in that this one is particularly good. Coming from a friends mother, you can tell this recipe is from a gourmet trend passed not quite long enough ago to be trendy in a retro way. But over done and ‘so last decade’ is half the charm. Its sweet and intense, simple but very good. These pears come poached in a thick and syrupy red wine sauce with a gentle taste of star anise. This is also a recipe I served at friendly beaches lodge. 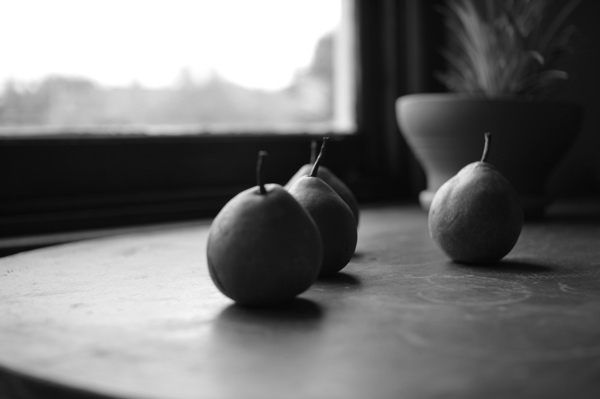 Peel the pears and cut their bottom flat so they will stand upright when served. Heat the butter in a medium sized saucepan (you want a saucepan that the pears will sit in snug), and lightly brown the pears in the butter. Add the red wine, sugar and star anise and bring to the boil. Simmer with the lid on for abut 45 minutes or until the pears are soft and cooked through. During this time you should turn the pears and spoon over the sauce to keep them moist on all sides. Finally, remove the lid and simmer until the sauce reduces and turns syrupy. Serve with cream. And there you have it, not so average red wine poached pears with star anise. I had a sourdough starter given to me from a friend who had been given it from someone else who had inherited it from his mother. The original was rumored to be 30 years old or so the story goes, and no wonder it made such lovely bread. It wasn’t my first, I had inherited others and made some myself but I was never devoted enough to go the distance as travels would take me here and there and houses were often new. Needless to say, a lot of them got lost or perished along the way. But during their various lives spent with me, they all became well-loved members of the family. Even though my descendent of the 30 year old starter had not been in my life more than four months it was no exception, it had worn a comfortable place in my heart. But one day it mysteriously disappeared, the little jar where it sat dormant in the fridge was gone without a trace. My reaction was one of somewhat panic. The mysteriousness made it all the more tormenting. I felt I had lost a wise old friend. After some lonely days left yearning for some dough to stir and knead and bake and smell, I pulled myself together to start again, from scratch, to see what kind of a beast this spring Melbourne air would bring to a culture. 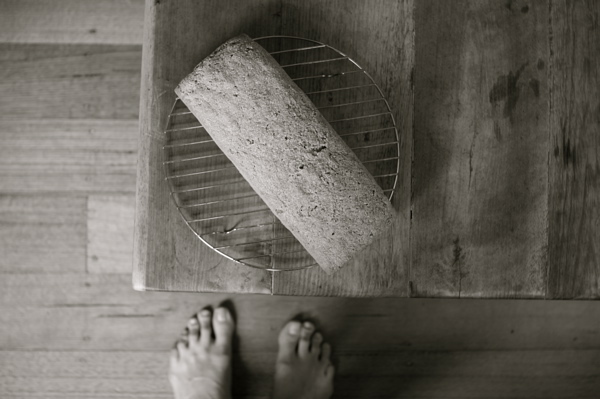 Also, I have been wanting to post a recipe on sourdough for sometime now but never knew quite where to start… I guess at the very beginning is best. Sourdough is pretty much a way of making bread without conventional yeast, instead you use natural yeasts harnessed from the air. And thats what is so very wonderful about it, every culture is unique taking the native variety that comes with the location. 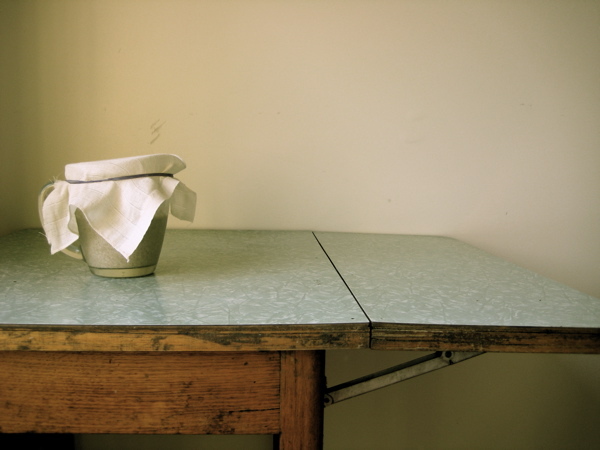 Place 1 cup flour (I like using spelt or rye, but any wholemeal flour will do) and 1 cup water in a large wide-mouthed jar, stir well and let it sit, covered with a muslin cloth, for about 4-6 days or until it starts to bubble. During this time you must stir it at least once a day, twice is better – once in the morning and once in the evening. When it bubbles and starts to rise in the jar you should notice it has a nice sour smell. 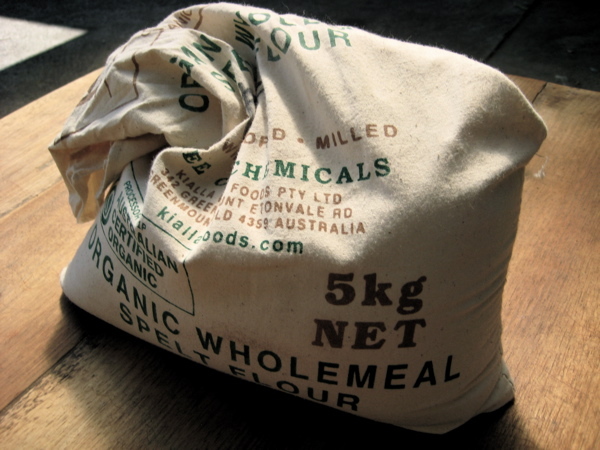 You can now add 1 tablespoon of flour every day for 3 or 4 days and continue stirring as before. It should get more bubbly and be doubling in size between feeds. Now you know it is ready and you can either feed it one last time and store in the fridge with a muslin cloth covering the jar or begin making your bread. When storing the starter in the fridge it is best to feed it about 2 – 3 Tbsp of flour and a dash of water twice a week, it should remain the consistency of a thick paste or very wet dough. It will last in the fridge for about 3 weeks without being fed but might need a bit of extra feeding and stirring to get it happily bubbly again. You will get a feel for it as you go along. The foundation for this recipe comes from another old friend Jenny, who gave me my very first sourdough culture about 5 years ago. First you will need to empty the sourdough starter into a large bowl. Here its best to use a porcelain non reactive bowl. Stir in 1 cup water and 1 cup flour (again I like to use spelt or rye, but you can use any flour, or any combination of flours). Return half the mixture back into your jar, cover with your muslin cloth and return to the fridge for next time. Let what is left in the bowl sit for 6 – 12 hours. I usually cover it with a plate to prevent anything falling in. When it is active and bubbly again, add another cup flour and water, mixing well. Allow to rest for another 6 – 12 hours (the colder the weather the longer it will need). Once active for a final time, its ready to make your bread!! (note if you used a starter that had been left in the fridge unfed for more than a week it might need one more feed at this stage to get it really bubbly and happy again). You should now have roughly 2 cups of mixture. To your mixture add, 1 cup water, ~ 3 – 3 1/2 cups flour and 1 tsp salt. Stir until combined. Then knead for 10 minutes adding more flour as needed. Richard Bertinet has a wonderful technique for kneading, really just the French way, but he is where I discovered it. I found a rather unglamorous you-tube demonstration here. You will need a slightly wetter dough than my recipe, so add less flour. Also, I have never had success with this kneading method when I have used rye. A combination of spelt and wheat or all wheat seems to work best. I think high gluten is important here. You will end up with a more chewy result with this technique but its a bit more tricky so it might be best to master the basic sourdough before moving into complicating ways of kneading. 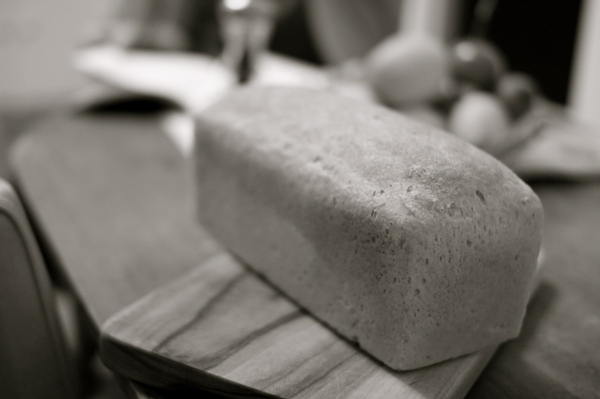 Once kneaded into a smooth dough, place into a greased and lightly floured bread tin and allow to rise covered with a damp cloth or plastic bag, until it doubles in size. This is usually between 6 and 12 hours depending on the temperature. Hot weather will make it rise a lot faster. You also have to be careful you don’t let it over rise as you will notice it starts sinking again. Finally, bake in a pre-heated oven at 200°C/390°F for about 45 minutes or until it sounds hollow when tapped. 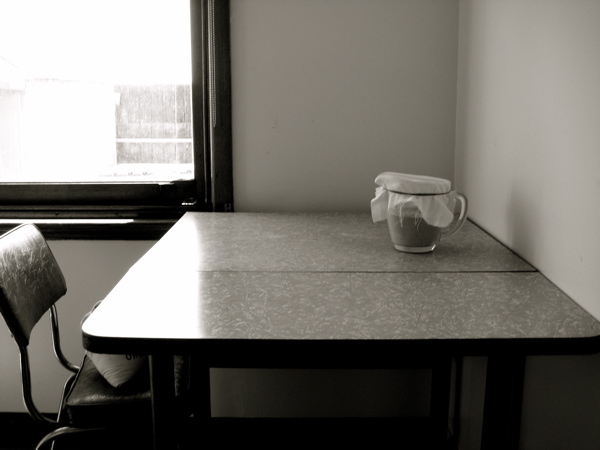 You are currently viewing the archives for November, 2011 at the invisible cookbook.